Past the field beyond Weymouth in Southern Pines is a forest called the Boyd Round Timber Tract, "round timber" being the local expression for old-growth trees that have endured the test of time. This last remaining tract of virgin longleaf pines would have met the same end that claimed the rest of the forest had it not been for a remarkable woman named Helen Boyd Dull. 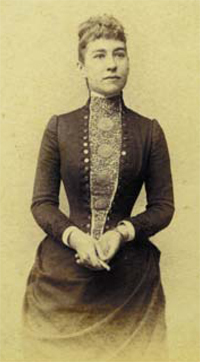 Helen was the oldest daughter of James and Louisa Boyd, born with a love for nature. The long-told story of Helen's introduction to the old timber began in the early 1900s, when her train was delayed at the station in Southern Pines, and she went with her father on a carriage ride to explore the forested ridge overlooking the town. Climbing the hill, they turned back to catch a bird's eye view and saw lumbermen busy leveling the forest in all directions. As the carriage moved through the giant pines, they passed scores of bleeding trees, their trunks etched with V-shaped cuts to let loose the flow of sap collected for turpentine, pitch and rosin. Stirred by his daughter's heartfelt plea to buy the land and spare the trees, the elder Boyd purchased the entire ridge and saved the stately pines. The arrival of Helen Boyd Dull marks the point when the town began to turn away from turpentine and the sawmill. Helen's father opened the grounds of their grand estate, with public roads in all directions. Southern Pines became the land of busy nature lovers, who lined the streets and train tracks with native plants - close to the grove of longleaf giants that crowned the town's eastern ridge. 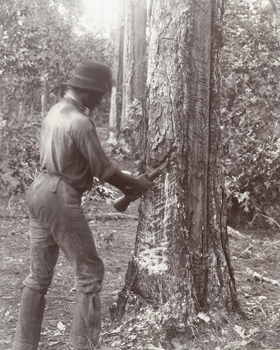 The saw was never the only danger to round timber and in the spring of 1909 a fire threatened the great woods. Kindled by a spark from a locomotive, a brush burn began sweeping up the hill. Nearly as fast as the shout of "fire" crossed the land, all the men in the town started battling the flames. As the blaze advanced up the hill, a wave of fire surged high above the trees, and with a sudden explosion, the forest was enshrouded in flames. Eyewitness accounts tell of burning cinder three inches square raining down on the town and seeing Helen running toward the men who fought the fire, only narrowly escaping with her life. Many of the grand pines were reportedly lost that day. Helen Boyd Dull left this life on Aug. 9, 1924. The year before she passed away, a tribute was given in the city park in Southern Pines to honor the great trees that gave the town its name, and to recall the story of the woman who had saved them. The news of Helen's death was met with far-reaching sorrow and a sense of loss but was softened by the gifts she left behind.